As signs of command and authority, the battle-axe and war hammer are as old as the mace. Their use extends into the sphere of sacred things. In this context one should remember the cult axes of ancient Crete, the skillfully cast axes of the Luristan civilization, the hatchet of Baal of Doliche, and the hammer of the Germanic god Thor. 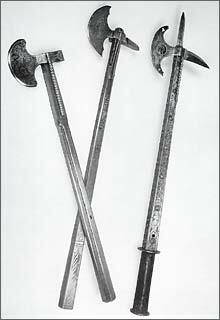 Battle-axe and war hammer--frequently together--hung from the saddle of cavalry officers as a weapon of command during the late Middle Ages. They were still used for this purpose in the renaissance. The three examples shown here form a group that goes back to the early 16th century. The owner of only one, with the uniformly blackened decoration, is known. It belonged to Otto Heinrich, Count Palatine of the Rhine (1502-59), Elector Palatine (from 1556), and the founder of the Otto-Heinrich wing at Heidelberg Castle. One axe is delicately decorated with goldschmelz on a blue ground. The other two show the blackened etched patterns which, though practiced by Italian craftsmen in the 15th century, were only brought to their utmost perfection for the decoration of weapons by German artists in Dürer's time. The rounded armour surfaces were etched with acid and the patterns thus formed resulted, so to speak, in unprinted etchings, and these are called works in the "Hopfer-style" after Daniel Hopfer the Elder of Augsburg. Incidentally, he appears to have been among the first to utilize the technique of etching iron plates for the reproduction of his designs. His plates, smeared with printers' ink and then rolled off on to paper, gave us--apart from the famous ones by Albrecht Dürer--the first iron etchings. The classic engraving on copper plates was only developed later. It's nice to have a good view of the near side of these weapons, which gives a good look at the belt hooks (or whatever you would want to call them... on pistols they're belt hooks) that they all three have for hanging off the pommel of the arming saddles. It's something that you don't usually get to see. Now for the shots of the battle-axes and war-hammers combined with wheellock pistols! Thanks as usual, Nathan, for a great shot of some nifty stuff! Okay, now how sharp are these suckers? They look pretty dull in the pics, I mean my axe for log splitting looks sharper. Do you mean how sharp are they now or how sharp would they have been in the 16th century? I wouldn't expect them to have a really sharp edge if they were ever to be used in battle against any type of plate armour.